One thing I noticed going through my recipes the other day (and I’m sure you’ve noticed too) is that I don’t have many options for breakfast. It’s not like I don’t like breakfast, I do. But remember I work nights. So I usually eat my breakfast as you all are eating your dinner. I know, kinda backwards isn’t it. Chili for breakfast? Yep, that’s usually my norm. But something tells me you are not going to want to see a chili breakfast anything……so let me fix this once and for all. There we go. That’s much better. These little muffins are completely vegan, with no added fat, butter, or oil – so are also 100% McDougall Friendly. Oatmeal, applesauce, flax seeds, almond milk, walnuts…. you know, breakfast foods. All compacted into little bite-sized mounds of sweet yumminess. And you know, I got the inspiration for this recipe from the strangest of places. Well not strange in that Lee Drummond is the most amazing cook, or the queen of all food bloggers. Her blog The Pioneer Woman is like one of the food blogs in America. But she had this recipe for Oatmeal Banana Muffins that looked so good and was already pretty darn close to being vegan, that it didn’t take much to tweak it for all of us veg-heads that don’t live out on the range. So that’s what I did. I replaced the buttermilk in her recipe with almond milk and a couple of teaspoons of apple cider vinegar and I replaced the egg with a flax egg. Oh, and I completely forgot the banana. Oops. But they still came out wonderful. Moist, full of flavor, and super-duper healthy. 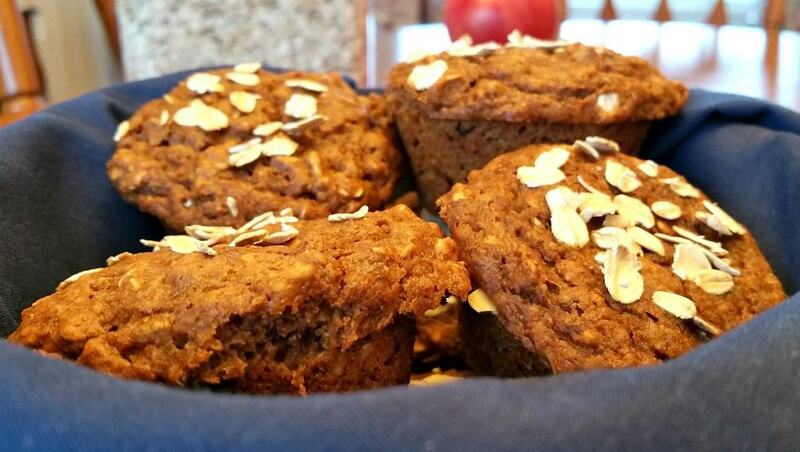 If you’re not familiar with Flax Seeds and are wondering what in the heck a Flax Egg is ……. let me explain. Flaxseeds are a rich source of micronutrients, fiber, manganese, vitamin B1, and the essential fatty acid called omega-3. They are often used in baking recipes as an egg replacer and binder. When you grind these seeds up and add some hot water, it magically turns into a kind of disgusting looking gelatinous goo that works the exact same way as an egg. Weird huh. Strange but true. So for the “Flax Egg” in this recipe, simply take 1 tablespoon of Flax Seeds and grind them up in an old coffee grinder. Then add 2-3 Tablespoons of hot water and stir (use a small bowl – not your coffee grinder – duh). After about a minute or two it will be ready to add to your recipe. Ok enough prep talk. Are we ready to bake some muffins? Simply take all the dry ingredients, up to the milk that is, and stir together in a bowl. Like I said, for the ground flax-seed either use a coffee grinder, or buy some flax-seed meal which is already ground. If you are watching your fat content you can completely eliminate the walnuts. They add a nice bit of texture but are not necessary. Not stir it all up until there’s no dry stuff left. Don’t over stir this or they’ll come out as dense as little hockey pucks. Just enough to get all the dry stuff moistened and no more. Now scoop a tablespoon or two into each cup of your muffin tin and bake at 350 for about 18 minutes, or until a toothpick comes out clean. You can use those little paper muffin cups so they won’t stick to your tin. 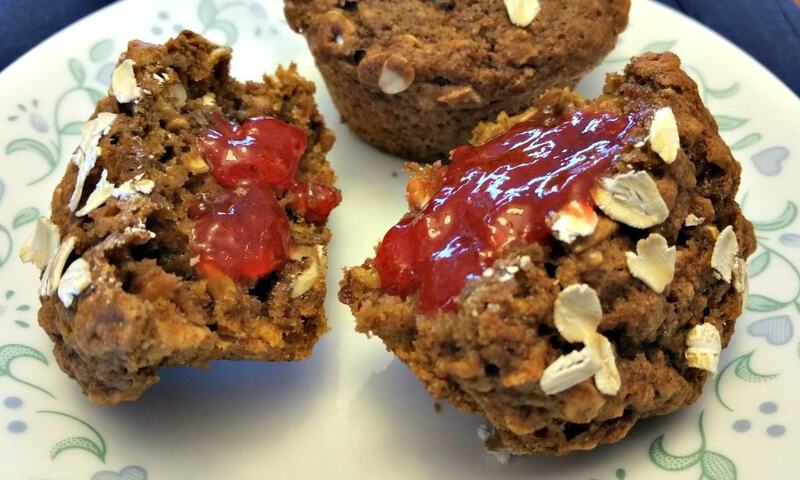 Moist, chewey, healthy, muffins made from oatmeal and applesauce. 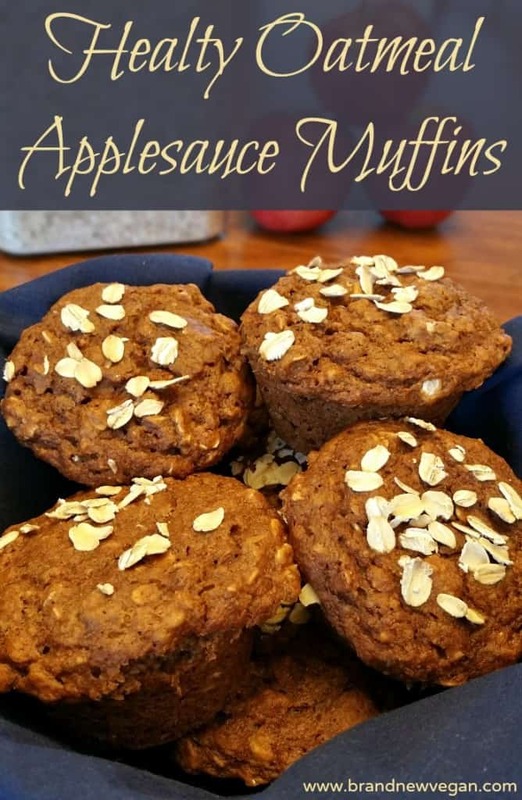 These Oatmeal Applesauce Muffins are completely vegan, with no added fat, butter, or oil - so are also 100% McDougall Friendly. Healthy and yummy! Make a well in the center of the dry ingredients and slowly pour in the liquid mixture. Pour into prepared muffin tin (or use paper muffin cups) and bake for 15-18 minutes. 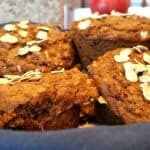 does anyone out there have a tried and true, vegan banana bread recipe. I have ripe bananas overflowing out of my freezer and need some great Tried and True Family favourites. OMG! The best ever—I was filled up after 1 but I polished off 3, then returned for 1 at lunch and for an appetizer. This is a keeper! Thank you so much! These are officially delicious! Yum! This recipe has been printed and is going in my “favorite recipe binder”! These are a great breakfast muffin. I followed the recipe exactly and added a crumble. This is a great recipe. I love use of brown sugar and molasses. I skipped the flax egg, it seemed like overkill with applesauce and flax which act as a binder and they still held together perfectly. I also subbed 1/2 c of the all purpose flour for buckwheat flour. I think I will continue to do this or use an additional 1/2 c of ww flour interchangeably.